Reclaimed Sapele, Paulownia, discarded wood turning samples, acrylic and milk paints. My arts practice addresses the overlap and gap between that which is grown and that which is built, tensions between the living and manmade worlds, and related issues of social connection, resource use, and sustainability. Philosophical concepts of Descartes and Bacon underpinning the Age of Reason called for control of nature and the cultivation of the wild; the superior regard for linear systems has historically undermined many complex systems, such as unmanaged forest floors, that science is just beginning to comprehend. 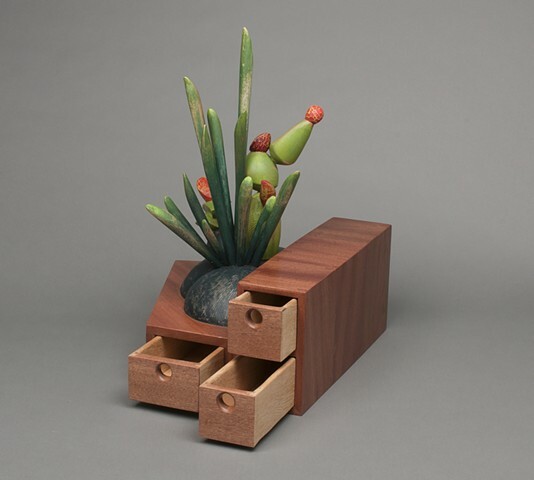 Ikebana Tansu combines interpretations of two iconic Japanese craft forms: the step-Tansu cabinet and Ikebana flower arranging. Tansu are traditional storage chests and cabinets containing precious documents and belongings. Ikebana takes a Wabi-Sabi approach to floral arrangements that are balanced and spare representations of nature through many life stages including stalks, leaves and few buds or blossoms. Ikebana Tansu is a case for small treasures to be kept within four drawers and one interior compartment. The case is geometric and clean-lined, but asymmetric, and a burst of plant-like growth emerges from the notch of the step like wild grasses forcing their way through cracks in the sidewalk. Ikebana Tansu presents a balance and tension between control and wildness within a single object.